When I was a small kid, I used to absolutely love reading fairy tales. My grandfather had bought these two hardbound volumes from the seven seas yonder that were absolutely full of them. I never managed to completely read the book end to end, but I had read a lot of them. Then came school, junior college, engineering, work, mba, work and with all of them, the facts about life. Now I am a person who can safely say is well-grounded in reality. So much so that I have more or less stopped watching cartoons, even Tom & Jerry, which my father still loves and laughs out loud like a small child when watching the same. 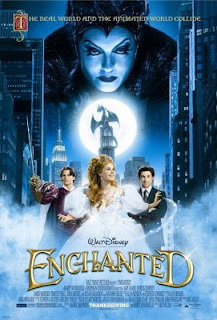 Disney and this new movie, Enchanted brings out that mirthful child in all of us. I had an absolute rollicking time throughout this movie.